Technology is moving forward. The last wave of the development in cloud and mobile technologies, data management and collaboration created a tremendous opportunity to change the way people think and work together. It can impact company processes strategically as well as a unlock a potential to innovate differently. It applies to internal organizational processes as well as collaboration between organizations, partners and individuals. Collaboration takes people from different worlds to places they might not have gone on their own. Of course, it invites new ideas from the outside, but it also accelerates your own thinking. In my experience, when the right creatives connect, it can be like setting off a chemical reaction. I find that incredibly stimulating and potentially very powerful. Collaboration among individuals, brands, and industries will only continue to accelerate as technology facilitates and enables greater connection in real time from anywhere in the world. It’s why we’re experiencing such an unprecedented pace of innovation in every aspect of our lives. It’s clear to me that if all the ingredients are right, collaboration can help shape your vision of the future and get you there faster. At the same time, I found interesting a negative notion of “prescriptive” collaboration. How can a collaboration go wrong? One way a collaboration can go wrong is if your connection is inauthentic or overly prescriptive. Our collaborations aren’t transactions. They are relationships – ones that have been built over months or years before they even come to fruition. You really have to be passionate about the same parts of the universe for any partnership to work. So, where is a border between collaborative empowerment and prescriptive collaboration? How to translate it into real practice, software applications and functions. For the last few years, CAD and PLM vendors made significant investment into the development of collaborative features in new and existing applications. 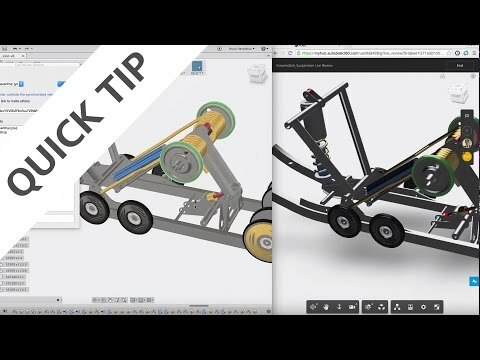 Here are few examples of collaborative functions enabled in Autodesk Fusion360, Aras Visual Collaboration and Onshape. If you have other examples, please share with me in comments. At the same time, I can hear some skeptical voices about the fact in real life collaboration might be not as important as it presented in CAD and PLM applications. In a nutshell, the logic of these comments is narrowed to the fact engineers are not really want to work together and most of work is done separately. How does it come together with a broader vision of collaboration? What is a right level of collaboration engineers and other people in organizations are demanding in modern manufacturing environment? What is a real need and what is a marketing gimmick? These are questions I’m always asking engineers in manufacturing companies as well as software vendors. You know I love Aras, but putting it in this “real time” collaboration list doesn’t really fit, no? And for OnShape you didn’t put the live collaboration video. If it is about collaboration, then more solutions can fit in this category, right? Hi Yoann, Thanks for your comment! I’m really curious what is the “modern” definition of real time collaboration in a cloud era. Re Onshape. The fact I can see user presence online when 2 or more users are accessing the same document is “real time” in my view. Don’t you think so? Have you seen another Onshape video that is more appropriate? Please let me know. Re Aras. I think the ability to add commentary into visual (viewer), write comments and communicate is almost “real time” as I’d think about it. What do you think? Actually Onshape has “Live collaboration” option similar to Autodesk Fusion360. I just wanted to bring different examples. Do you have other examples to share? What is your definition of “real time collaboration”? To me the live collaboration is just like it is shown in the OnShape vidéo. two persons working on a same item and being to collaborate live (i.e. getting your own environnement updated with the other users changes, and vice versa). I agree – firebase is a good example. It is an easy programming model for collaborative application. The notion of “item” is simple when you think about one geometrical part, but it gets complicated when you assembly or you work on a product with a collection of information sets – Aras example is more relevant in that case. For most of the cases, when I see “collaboration” in facebook-like style including real time presence model with real time comments that can be applied to viewer, I’d still call it real-time, but I understand that it would be controversial. This is an intriguing discussion, especially considering rampant abuse of the term “collaboration” in most enterprise (and not just CAD/PLM) marketing. To answer your question below – “real time” in my view is simultaneous edit. That means two or more people making changes and each seeing those changes as they happen. Of course there are change management consequences for that which may interfere with maintaining proper integrity of the design. The branch/merge solution that Onshape uses it’s a step in the right direction, but there are some caveats with merging designs and conflict resolution. Ed, thanks! – look forward to read and comment (or even blog :)).